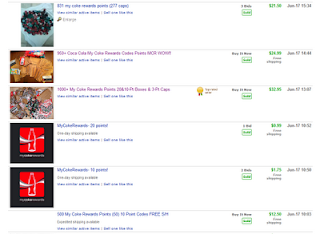 Despite the many offerings for My Coke Reward Points, my recent auction listing for them was pulled. This listing has been removed because you are listing My Coke Reward points. We do not allow listings that promote giveaways, random drawings, raffles, or prizes. These promotions are highly regulated and may be unlawful in many states. Because of this, we don't allow the sale of "My Coke Reward" points as on their website, you can enter a sweepstakes for prizes. We understand that you may not have been aware, but please do not relist these or any other coke reward points on our site. As for why there's even a Everything Else > Reward Pts, Incentive Progs > Reward Points category for selling such things, it's because not all rewards programs allow the points etc. to be used as sweepstakes entries. And, it should be noted, nothing in the eBay policy (currently) states that you can't sell the rewards you receive from the points, coupons, collectibles, etc. All this means is that you'll have to find other outlets for selling your Coke Reward Points, including Craigslist, etc. Of course, there's Lista. And there are also some forums for trading these points, such as MyCoupons and SlickDeals, and even in regular trading or hobby sites such as SportsCardForum. So check out the communities you are already in; maybe there's an option where you already hang out. These and other headaches are due to end when Coke ends its "loyalty" points program at the end of this year. Enrollees may not purchase or otherwise acquire codes from third parties and may not combine codes obtained by others for deposit into a single Enrollee's account. Enrollees may not transfer or sell codes under any circumstance, other than in programs authorized by Sponsor. Any attempt to combine or transfer codes or points will result in disqualification from the Program and forfeiture of all points in the Enrollee's Account. The Coca-Cola Company reserves the right to take any other or additional action it deems appropriate in its sole discretion in the event that The Coca-Cola Company believes (in its sole discretion) that an Enrollee (or Enrollees) have violated any of these provisions.